NOTE: This download is an excerpt of the full book set to release September 4th, 2018. The full book is available for pre-order on Amazon. Until very recently, the path to success within the music industry was much clearer. The successful combination of song, producer, talent and potential would capture the attention of a record label...and their machinery, belief and investment would launch the artist into the realms of radio and touring. Now, various and often conflicting opportunities float in what have become cloudy waters. Successful YouTubers get record deals. Unsigned high school students produce songs in their bedrooms and hit the iTunes charts. Reality stars with large followings and no musical talent sell out arenas, and established successful musicians now compete for space on Snapchat with popular “tweens” that already have product endorsements. 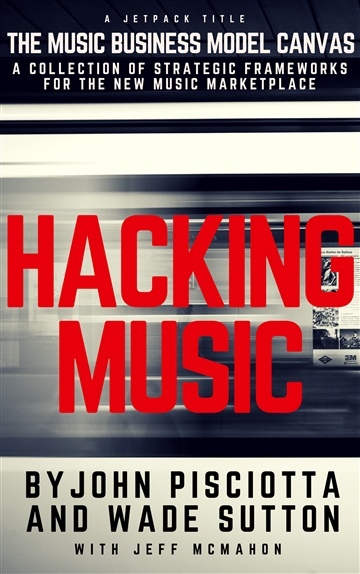 Hacking Music is a book that you do, not just to get you to a record deal, but to get you through a record deal. Hacking Music takes the artist “behind the curtain” and shares the concepts and systems used daily by industry professionals and authors John Pisciotta (Jetpack Artist Ventures), Wade Sutton (Rocket to the Stars Artist Services) and Jeff McMahon (former Tim McGraw keyboard player) that will bring you back to this book again and again as you build your career. With clients in major cities like Nashville, New York, London, and Toronto, Rocket to the Stars’ Wade Sutton utilizes more than twenty years of professional radio, journalism, and music industry experience to help artists in all aspects of their careers. His strategies have been featured on top websites for independent musicians such as CD Baby and Disc Makers. Wade’s previous book, The $150,000 Music Degree, was co-authored with former Taylor Swift manager Rick Barker and was read by many in the industry, including country music superstar Dierks Bentley. John Pisciotta is the managing director of Jetpack Artist Ventures, a Nashville-based venture studio accelerating high-potential media properties, both iconic and developing, across the divisions of recording, music publishing, artist services, and artist management. In addition to raising substantial capital for artists, Pisciotta’s work with Jetpack has helped client-artists receive an ACM nomination for “Musician of the Year” and American Music Award “Song of the Year” and “Video of the Year” nominations. Pisciotta has also created and taught courses at Nashville’s Belmont University.